In the first governments of the Restoration, he was successively Secretary General of the Ministry of Justice, a member of the Council of State and Director of Departmental and Municipal administration in the Ministry of the Interior. 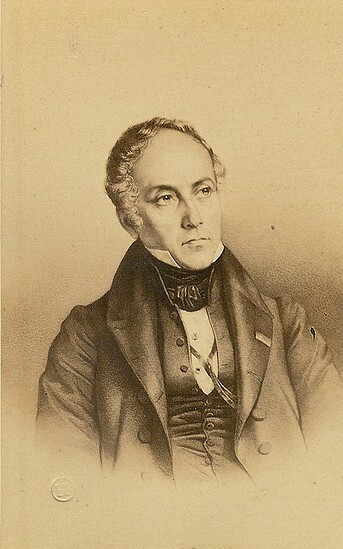 From 1817, with Royer-Collard and other political friends, he formed the small “Doctrinaires” group, supporting a liberal interpretation of the Charter. However, in 1820 when the ultra-royalists came into power, he found himself in the opposition and was dismissed from the Council of State. Two years later, his history lectures at the Sorbonne on the origins of representative government were also cancelled. During these two years, he published four pamphlets severely criticising the Ministry, bringing him further and further towards the left. From 1827 onwards, at the head of the association « Aide-toi le Ciel t’aidera »(Heaven helps those who help themselves), Guizot was seen to be one of the main opponents of Charles X’s policy. During this time, he wrote many major historical works, first publishing Essays on the History of France (1823), then the first two volumes of the History of the English Revolution (1826-27). The triumphant re-opening of his lecture courses in 1828 was a public event attended by a large audience of liberal-minded students.